The 2018 Pirelli World Challenge season is the twenty-ninth consecutive year for the championship. There are five race weekends. The Grand Touring category title chase kicks-off in March at Saint Petersburg. This event is followed by races at Long Beach, Canadian Tire Motorsport Park and Road America. The finale takes place at Watkins Glen International on the Labour Day weekend. Grand Touring (GT) – This is the series quickest class and includes cars that predominantly fall into the FIA GT3 category. These are two-wheel drive vehicles that may use normally aspirated or turbocharged engines which produce approximately 500 horsepower. Examples of cars competing in this category include: Porsche 911 GT3 R, Mercedes AMG GT3, McLaren 650S GT3, Aston Martin V12 Vantage GT3, Bentley Continental GT3, Audi R8 LMS, Lamborghini Huracan GT3, Chevrolet Corvette C7 GT3-R and Ferrari 488 GT3. Grand Touring Sportsman (GTA) – This class includes the same vehicles as Grand Touring. However, the drivers are not considered professionals. Competitors in this category are evaluated after each event and based on their performance may be elevated to the Grand Touring class. Grand Touring Cup (GTC) – The Grand Touring Cup class was originally for the Porsche 991 GT Cup cars. It now includes vehicles from other spec series – the Lamborghini Super Trofeo and Ferrari 458 Challenge championships. 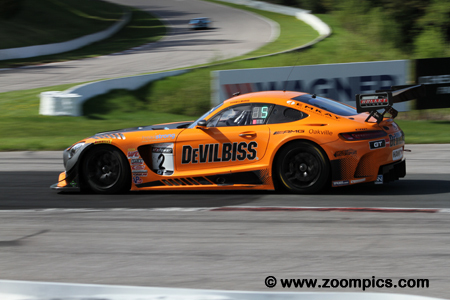 Rounds four and five of the 2018 Pirelli World Challenge championship for the Grand Touring cars was held at Canadian Tire Motorsport Park (CTMP). Drivers would compete in two fifty-minute sprint races around the ten-turn 2.459-mile road course. 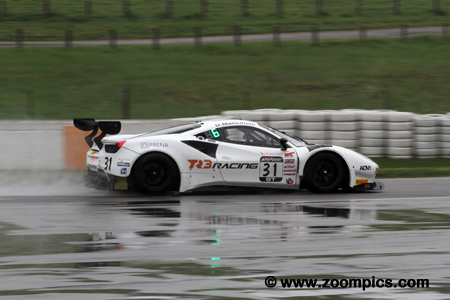 Despite a disappointing entry list of only ten cars, there was some excellent racing. The first lap of round five through Moss corner. 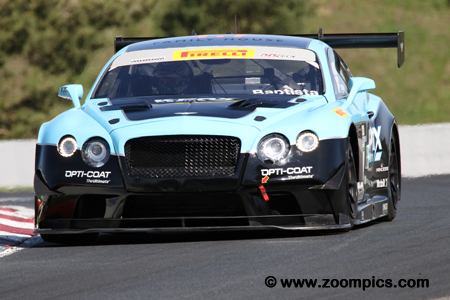 Leading the way is the K-PAX Racing Bentley Continental GT3 driven by the pole-sitter, Alvaro Parente. Trailing Parente is the second place starter and his teammate, Rodrigo Baptista. Behind Baptista is the Ferrari of Toni Vilander who was gridded third. 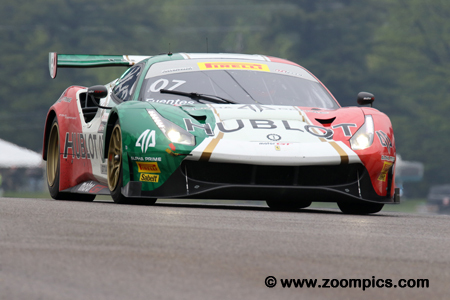 Local favourite, Daniel Morad scored his first victory of the season in round four at Canadian Tire Motorsport Park. 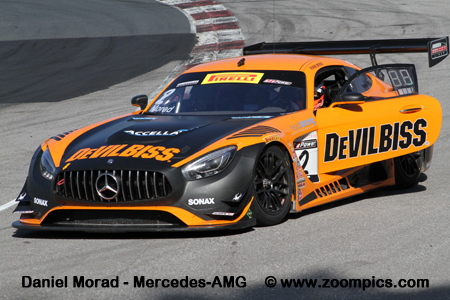 Morad driving the CRP Racing prepared Mercedes-AMG GT3 was the fastest during the very wet qualifying session. At the start of Saturday’s race, he pulled away from the field but had to slow as the track dried. The following day, Morad started six and finished fifth overall and fourth in the Pro class. It was a good weekend for the Squadra Corse Garage Italia Ferrari 488 GT3 driver, Martin Fuentes. Competing in the GTA category, Fuentes finished eighth overall and a close second in the class on Saturday. In round five the Mexican posted the same results. As far as the big picture is concerned, Fuentes leads the GTA SprintX and GTA Sprint classes and is seventh in the overall standings. Rodrigo Baptista drove the No. 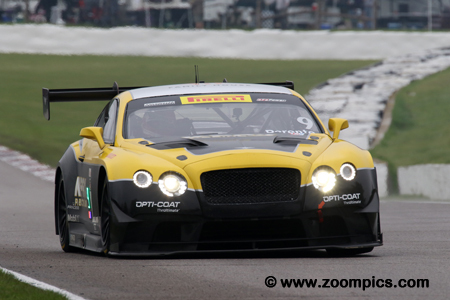 3 Bentley Continental GT3 in the Amateur category of the Sprint and SprintX classes. Baptista was the slowest qualifier for round four. During the race, the team brought Baptista and his teammate Alvaro Parente into the pits for dry tires allowing them to set the fastest laps of the contest. As a result the pair started Sundays race on the front row - Baptista finished second overall and first in class. In round four, Parker Chase driving the TruSpeed AutoSport Audi R8 LMS held off the hard-charging Ferrari 488 of Martin Fuentes to score his first GTA victory. Chase was fourth quickest in the wet qualifying session. He pulled out an early lead but as the track dried, he fell off the pace and was only 0.559-seconds ahead of Fuentes at the checker. On Sunday, Chase started ninth overall and finished second in class. In the wet conditions on Saturday, Toni Vilander qualified sixth and finished fifth in the Remo Ferri Motorsport Ferrari 488 GT3. Based on his fastest lap in round four, Vilander started Sunday’s contest in third place. He was unable to match the pace of the two K-PAX Bentley’s and captured a runner-up finish in the Pro category. 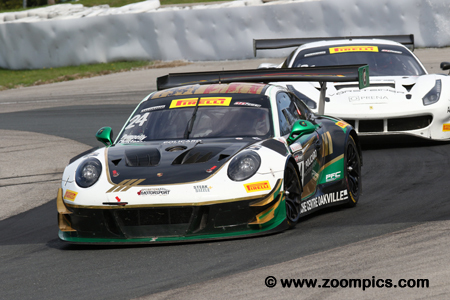 Vilander left CTMP second in the overall title chase and closed the gap on Scott Hargrove. Alvaro Parente’s season had been miserable. Parente failed to score points in round one at St. Pete and both races at Virginia. Also, his primary Bentley and the team’s backup car were severely damaged. For the CTMP rounds the team shipped a Bentley from Malaysia. Parente was not competitive in Saturdays contest but on Sunday he started from the pole and led flag-to-flag to score his first win of the season. It was a good points scoring weekend for the driver of the Alegra Motorsports Porsche 911 GT3 R, Michael Christensen. 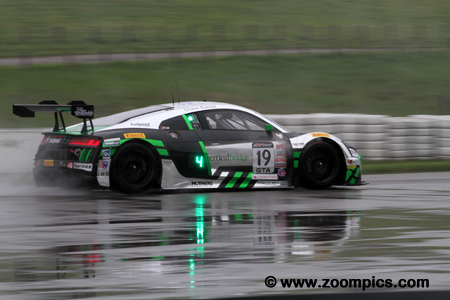 Christensen’s best result to date was a third-place finish with his co-driver, Spencer Pumpelly in the round four SprintX event at Virginia. 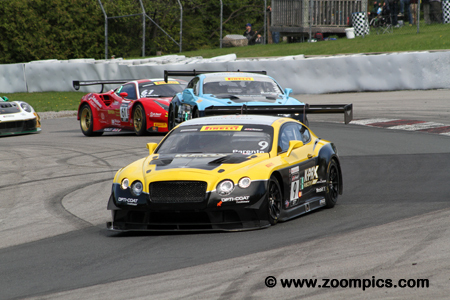 At Canadian Tire Motorsport Park, Christensen qualified third and took the runner-up spot. On Sunday, he started fourth and finished third in the Pro class. Daniel Mancinelli was scheduled to compete in just the Sprint races for TR3 Racing. A dispute over a Balance of Performance weight adjustment caused the team to with withdraw the car from rounds one and two at Saint Petersburg. Mancinelli was back in the team’s Ferrari 488 GT3 for Long Beach where he won. 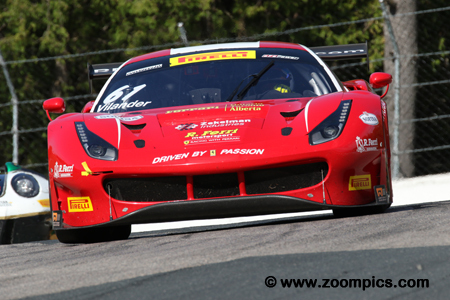 At Canadian Tire Motorsport Park, he scored third and sixth place finishes.